The Sopwell Residents Association has been given a free four hour slot at the first ever Christmas Market in St Albans. It will be a German style Christmas Market and we will have our own little festive chalet where we can display our wares. Our slot is from 10am until 2pm on Saturday 7th December and we will be just outside the Vintry Gardens near the Cathedral. It should be fun! Obviously, we will be showcasing the Sopwell Memories project and hoping to recruit some more interviewees and hearing their stories. 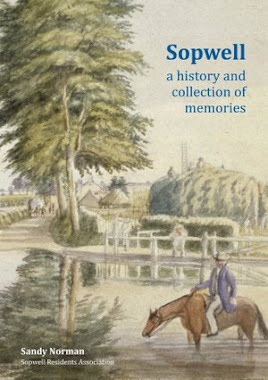 The book Sopwell: a history and collection of memories will be on sale as well. It is a lovely book which traces the story of Sopwell and its people, from the rural landscape of medieval times to the development of the pre- and post-war estates of today. It contains the memories of many people who live or have lived in Sopwell and there are lots of images, from photographs and paintings to family snapshots. That's a massive 33% discount!!!! But it’s just for the Christmas period; the offer ends on Friday, 20th December. Now that is a bargain. How can you resist? Makes an ideal Christmas present! The books will only be available direct from the Sopwell Residents Association at this price until the end of the promotion, so if you want one, send us an email to arrange to collect one or turn up at our stall at the Christmas Market on Saturday, 7th December between 10am and 2pm. Alternatively, you can buy the book on-line, for delivery anywhere in the UK. For delivery outside the UK, contact us with your full postal address, so we can determine the correct postage and packing. But if you can, please do come along to the stall and say hello. I can’t promise any Gluhwein but there will be plenty of cheer!